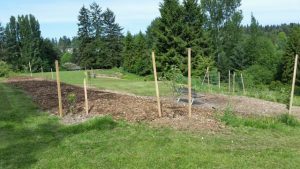 Future guests to the Meadowbrook Community Garden and Orchard (MCGO) will enjoy the effort of volunteers time and energy in the Spring of 2016. 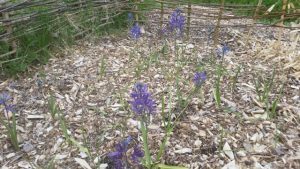 Taking advantage of shade, exposure, natural conditions and the kindness of educational institutions, this years offerings create a plethora of gardening experiences. 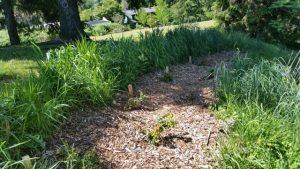 The tubers of the Camas plant have a unique Northwest native history (more to come, LOOK). With the yearly downhill runoff, conditions are ripe for this planting. The huckleberry plantings are nestled in a shady area which this fruiting plant loves. 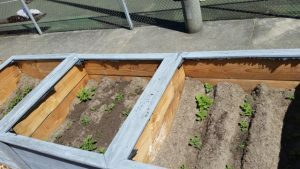 Planting potatoes in the donated cedar boxes utilizes the generous donation of Trinity Lutheran College in Everett WA. Closing their roof top garden gave MCGO a new resource to share the harvest with. The newly expanded apple orchard offers a variety of plantings that, once established, give volunteers the opportunity to easily access, care and harvest this popular fruit. As the years go by, these additions will give generations of homeowners and advocates the opportunity to understand that Seattle has to strengthen urban food production. It also gives Northeast Seattle an identity around a very important task. Feeding and caring for all in this city; important and rewarding. Great effort by the volunteers at MCGO; thank you!